Naomi Klein: "This book is downright scary. "Ethan Zuckerman, MIT: "Should be required reading." Dorothy Roberts, author of Killing the Black Body: "A must-read for everyone concerned about modern tools of inequality in America. "Astra Taylor, author of The People's Platform: "This is the single most important book about technology you will read this year. "A powerful investigative look at data-based discrimination―and how technology affects civil and human rights and economic equity The State of Indiana denies one million applications for healthcare, foodstamps and cash benefits in three years―because a new computer system interprets any mistake as “failure to cooperate.” In Los Angeles, an algorithm calculates the comparative vulnerability of tens of thousands of homeless people in order to prioritize them for an inadequate pool of housing resources. In Pittsburgh, a child welfare agency uses a statistical model to try to predict which children might be future victims of abuse or neglect.Since the dawn of the digital age, decision-making in finance, employment, politics, health and human services has undergone revolutionary change. Today, automated systems―rather than humans―control which neighborhoods get policed, which families attain needed resources, and who is investigated for fraud. 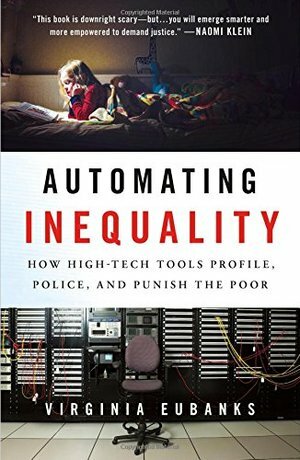 While we all live under this new regime of data, the most invasive and punitive systems are aimed at the poor.In Automating Inequality, Virginia Eubanks systematically investigates the impacts of data mining, policy algorithms, and predictive risk models on poor and working-class people in America. The book is full of heart-wrenching and eye-opening stories, from a woman in Indiana whose benefits are literally cut off as she lays dying to a family in Pennsylvania in daily fear of losing their daughter because they fit a certain statistical profile.The U.S. has always used its most cutting-edge science and technology to contain, investigate, discipline and punish the destitute. Like the county poorhouse and scientific charity before them, digital tracking and automated decision-making hide poverty from the middle-class public and give the nation the ethical distance it needs to make inhumane choices: which families get food and which starve, who has housing and who remains homeless, and which families are broken up by the state. In the process, they weaken democracy and betray our most cherished national values.This deeply researched and passionate book could not be more timely.